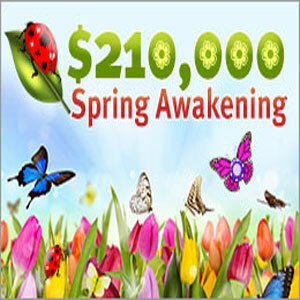 Intertops Casino players are jumping into spring with $210,000 in Spring Awakening casino bonuses. 300 players will get $30,000 in casino bonuses each week until April 27th and, as spring slowly turns to summer, there’ll be a $1000 Grand Prize draw. Intertops Casino gives rewards points based on playing and wagering. Every Monday players get bonuses up to $500 each based on their points. Contest details are posted at http://casinopromotions.intertops.eu/spring where players can check their current ranking any time. All players that rank in the top twenty of each week’s final scoreboard are eligible to win the $1000 Grand Prize awarded April 28th. Intertops has been popular all over the world for more than thirty years. In addition to hundreds of casino games from Realtime Gaming, there is also a poker room and sportsbook. Intertops was founded in 1983 in London with a UK Bookmakers License and relocated to Austria in 1992. They accepted the world’s first online bet in 1996. In 1997, the online business moved to Antigua while the traditional sports betting business remained in Austria. 1998 saw the launch of one of the first Microgaming online casinos. In 2001, the innovative company developed the first mobile betting application, enabling customers to bet with mobile phones anywhere anytime. By 2003 Intertops began online poker operations, progressing to online skill-based gaming in under a year. Intertops Casino now provides more than 300 state-of-the-art casino games from Real Time Gaming (RTG). It also offers more than 200 games from Wager Gaming Technology in the new Intertops Casino Classic. It has some of the biggest progressive jackpots available anywhere online including several that are currently well over $1,000,000.